The School of Architecture at Taliesin has recently had an identity change. No longer the Frank Lloyd Wright School of Architecture, SoAT has separated from the Frank Lloyd Wright Foundation. The SoAT student body has had an identity change as well—one that is no longer tied to the Master’s direct influence. Frank Lloyd Wright passed in 1959. The last remnant of his firm, Taliesin Associated Architects, Inc., is closed and the student body is now unable to learn from their projects by direct design experience during their development. However, the SoAT student body is still living on both of Wright’s properties, Taliesin and Taliesin West—so, they are still able to develop a deep kinesthetic appreciation for Wright’s core design precepts. 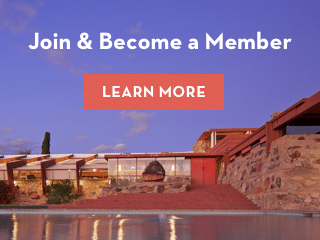 One aspect of student life identified by the current student body as requiring attention is the need for a student recreational space on the Taliesin West campus. The SoAT student body has expressed a desire for a communal space that allows them to unwind and relax—apart from the shelter spaces and studios the SoAT and Foundation provide them to pursue their intense academic goals. The SoAT student body has requested a design that is respectful of the School’s entire community—choosing a site that does not require modifying core historic spaces or views, does not disrupt Foundation tour activities, and is located in an area convenient to students. The area known as the Broken Lounge at Taliesin West has been identified as a space suitable for this future recreational use in student surveys, notable because it is a flexible space where students already like to congregate. It is versatile enough to accommodate their student government meetings and the activities of other informal student-based groups such as the Taliesin Shelter Maintenance Society. This thesis project addresses the desires and expression of the new identity of the SoAT student body in their student lounge space, flowing from deep analysis of several of SoAT’s iconic apprentice and student shelter designs, work, and communal life on both campuses. Variations are developed from the formal analysis of 5 shelters, each reflecting different approaches to design in harmony with the native landscape. An analysis of structural spacing in relation to landscape, proportional volumetric studies, and interrelation of design vernaculars reveals opportunities for evolution of the new project. This thesis relates this analysis to the students’ space needs, generating design variations to meet them that are harmonious with the history of the School and its desert setting. This design process has been particularly inspired by apprentices such as John Lautner, who studied with Wright but went on to developed his own design vocabulary, rather than imitate the Master. This is the approach the Broken Lounge thesis emulates—a proper expression in correspondence with Wright’s legacy rather than rigidly copying Wright’s design concepts. The Broken Lounge is mindful of Taliesin West’s rich history, previous student shelter projects, community ownership, maintenance and pride. Other precedents on college campuses similar to SoAT—with regards to design and building execution—were explored as other examples of how students develop their sense of community and bond, such as Rural Studio’s program and others. This thesis will explore these—sometimes conflicting—goals and ideas, and harmonize them to suggest specific restoration and expansion of the Broken Lounge to best meet the growing size of the student population and its recreational needs. all photos by Jose Amaya unless otherwise noted.